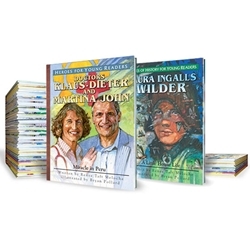 Heroes for Young Readers introduces younger children to the lives of Christian heroes! Whether reading for themselves or being read to, children love the captivating rhyming poems and unforgettable color illustrations of the Heroes for Young Readers series. This set contains all 23 books in this series. Heroes of History for Young Readers brings history, science, and government to life for younger children. This series presents the captivating true stories of inspiring figures who changed the course of history. Preschoolers through third graders can learn about the past from vivid color illustrations and fun, informative, rhyming text. This set contains all 7 books in this series.